It has been a few years since I read Saving Francesca and Looking For Alibrandi (I read my copy into destruction) but even after all that time I still remember how powerfully her writing affected me – Melina Marchetta was the rare exception made by a teenage me, a girl who at the time loathed to read anything that was not fantasy in some way. Quietly dramatic, the power of The Piper’s Son lies in its word – the ones it chooses to use and not use, what it says aloud but still leaving things unspoken. I was only a short way in when this power really hit me as a reader, the line “[t]he Toms in literary history had let him down and he hated them all” gently but firmly announcing how powerful and tugging on the reader this story was going to be. 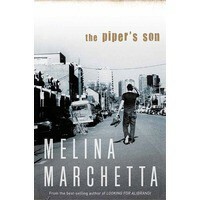 And while The Piper’s Son is an incredibly strong work in all respects – characterization, plotting etc. – it is the writing that really stands out above the fantastic nature of it all. Despite being a sequel to a YA novel, I would not exactly attach that label to The Piper’s Son. While there is nothing in The Piper’s Son that I would consider inappropriate for (older) teen readers, there is a maturity in the story and (externally) the characters that moves it above that general age range – Tom and his aunt Georgie, the two viewpoint characters, are 21 and 42 respectively, and their stories reflect where they are in their lives. While I would not be surprised that Georgie’s age and situation is a little distant for younger readers, the two decade age difference made no difference – her story, full of grief and guilt and so much more, was more than capable of tugging at my heartstrings. And that is what this story is about: two people, and those around them, dealing with the more painful of human emotions, and what everything going on around them and in the past means to them. You don’t have to have read (or remember what you did read) Saving Francesca to enjoy The Piper’s Son, so don’t let that stop you from reading it. Because if you don’t read it, you will be missing out on a novel that is, well, simply stunning.